No doubt there will be copy edits and regular edits, but the manuscript itself has been emailed to my editor's assistant. My revisions are done for a while. Mentor had a fairly big problem with the climax and end of the book and wanted more action so I expanded the fight scenes a little. This is what came to me to explain the tatt. Cratag is from the Southern Continent and left home at 15 (backstory in book) and was a merchant guard for a while as he travelled northward and to Druida. She chuckled, reached out and let her fingers trail down his thigh from hip to knee. Noticed black against the skin of his arm. "You have body art!" She was delighted. He grunted, glanced at his biceps. "No. List of merchant trips I guarded. References and...identifying marks." If he'd been killed and other parts of his body were unrecognizable. She swallowed. "They're only good for five years. They'll go away soon." "Oh." She yanked her mind to the present. So this is the only reference, I'm feeling pressure since the deadline is Sat. and it WILL be emailed Sat. I did add the amulet/necklace, but it's a little surprise and picks up quite a bit of the story...too much to explain. I'm hoping it works, too. May your imagination wander lovely paths today. Hollywood stuntwoman-turned-vampire hunter Dawn Madison is tired to the bone and beyond. Along with her comrades-in-arms, she managed to wipe out the Los Angeles Vampire Underground. And in doing so, she uncovered not only her own dark family heritage but also a terrible truth about the man she loves. Now all she wants to do is get to the next bloodsucking community, taking care of business with them, too. Luckily, when it comes to battling the undead, there’s no shortage of Undergrounds. May you enjoy all the adventures you find in a book today. I WILL NOT BE AT THE GREELEY BORDERS ON SATURDAY. I'm not sure what happened, but I heard last night that the signing will not take place. So I will not be there. May your plans stay good today. Signet D'Marigold's lonely life is shaken when a prophet reveals she is a catalyst for change... But to accept her new life – and the charge of a noble child, Avellana Hazel – will mean embracing a danger that may be fatal for them both. Cratag Maytree sold his sword and traveled across continents to find a place with his distant family. His settled life is disrupted as he is loaned out as a bodyguard for Signet and Avellana. Once again he feels like an outsider. I firmly believe in the "creative well" concept. Once you empty the well, sometimes you have to rest to re-fill it. That said, I'd really like to get proposals out by March 15. Whether or not I can do this, I don't know. Without proposals, at the point I am at in my career, I can't sell a book or series. Today has been blah (my own fault), but I should have a surprise for you tomorrow. May the day be peaceful for you. First, I'm grumpy because I had little sleep, I'm struggling to tighten Heart Change, and I was in the story and the world and the flow when some internet marketing company called Booksomething phoned and interrupted me. Now, promotion is a topic that ALWAYS comes up with authors and the fact is: WE DON'T KNOW WHAT WORKS AND WHAT DOESN'T. Furthermore, unless your publisher backs you with a huge push, you can spend a great deal with little result. But there's always someone out there ready to take an author's money. Why they target us, I don't know, because most of us are struggling. Maybe because there's no way to prove they didn't work. This guy hadn't done his research on Heart Fate. He didn't know whether it was listed with amazon.com or bn.com when he asked and I told him he said in a monotone "that is good" obviously scripted, and that just set me off. Naturally all I did was say I wasn't interested and hung up, but, like, I can't go to RT this year mostly because of the cost and this place wants to leach more money from me and will NEVER be able to produce figures that what I pay him/them is cost effective. A website is essential. I was tired of being out there alone, so I hooked up with Access Romance which charges a monthly fee (though I don't take advantage of them like I should). I also pay a gateway fee to Novel Talk (due this week). My local romance conference is coming up, not to mention RWA National. Those I consider important business tools. So this guy hasn't done his homework, doesn't even know how many books I've written (only referenced Heart Fate), where my books are listed online, is reading a script, and $!#$#$ called my HOME number during the day when he knows I am a writer. He is CLUELESS about MY BUSINESS and he wants me to give him money? If I'd been interrupted in a regular creative flow I'd'a reached through the phone and yanked out his tonsils. Ok, I feel better. I've advertised here and there. I'm on chats. I'm doing signings. I have this blog that my agent convinced me to do and is finally showing up more and more as links on other sites (AND THE FEEDBACK FROM YOU ALL HAS BEEN EXCELLENT). My agent wants me to do a newsletter. I haven't organized a mailing list, so that is something to be considered but will mean a lot of up-front work at some point. I advertise with people I trust. I advertise each book less than I did to begin with because I have little feedback as to how effective the advertising is. X site can say A ZILLION people visited our site! Great, how many SAW my book? Saw a pitch, a banner, what? No info. How many bought one of my books? No info. I like both Access Romance and Novel Talk, but they have a lot more clients than when I started with them. Sometimes I feel lost in the crowd. One of the reasons I went with Access Romance was because its colors matched my own, were pleasing to me. Loved the logo. They now have a new look and new logo. Shrug. Advice of the Day: Caveat emptor. Choose the places you advertise with wisely. If you spent a dollar on every book promotion site (or ad company or magazine) out there you'd be broke. Let me know if anyone can give you hard figures about actual book purchases and such numbers are in the triple figures. May you have someone to vent to today, should you need it. Yes, it's up, along with the appearances (on home page) of where I'll be signing. Also the final playlist of Echoes In The Dark...I'm still not happy with the men's themes, but so it goes. The contest is for a silk coin purse. No new excerpts this time, though I'm thinking next month I could put up a short-short story about Zanth (Fam in HeartMate) that I wrote for an anthology that didn't come to pass. The Free Your Artist page is new, as always. Once again we've started archiving the old pages (didn't realize that we weren't doing this, but now it's fixed. Meantime I have them all if they're needed). May you enjoy all the places you visit today. I have a friend I've known a long time through my sf/f reading group. She's been writing, but came along a different path -- the short story. But we've spoken of writing often (usually every Sunday at brunch) and she's found a workshop that really helps her -- in Oregon. Last night I get a call from her partner that there's an emergency and he doesn't know exactly where she is (I suspect she told him multiple times but didn't write it down for him). Do I recall the workshop? I don't but I think I might have an email from her or be able to figure it out. I do, but there is no info re: where it's taking place, city or hotel, but I do know one of the other people in the workshop. I'm on a loop with her. So I go to the loop and find an ad for an old workshop from 2007 and give the info to my friend (he's a friend, too) and note another hotel near by. Then I post a note to my loop requesting help. Five minutes later I have the current info. It's the same as the old stuff, so I sigh in relief. I can't tell you how much it meant to have a quick answer to my cry for help. Bless your friends and your connections. They can all come in handy for more than publishing someday. They can be true support in every sense of the word. Since I found myself saying this for minor things yesterday and this morning, I thought I'd share (ah, inflict it upon you). Stay right in and fight, fight, fight! Stay right in and write, write, write! May you enjoy some silliness today. Envy, like other negative emotions is a waste of time and a drain of energy. It's also human so OF COURSE I feel it when I see other writers making more of a mark than I. This can be hard, and I don't know that it's much talked about publicly, but we do talk about it privately. That said, I'm not feeling too envious today. Yesterday was a day off, I think the book is in good shape (will hear back from other beta readers soon), and the sky is blue and the weather warmish for this time of year. Again, as a writer, as with any other public entertainer, or any other person, you have to concentrate on the moment and that you have done your job well. If I want to break out of my midlist position, I must write something more popular, something that will get my editors behind me and push for the bigger numbers. So, that's what I can do myself to be less envious. I can cherish the moment. It's been fifteen minutes and Tommy has only whined once. I have my lovely house and some good tea and a pretty day and a neighborhood where I can walk down to get primo bread. These things count. Now, about the PEARLS, Heart Fate took Honorable Mention in the category I was in (Futuristic Romance). Yes,I felt a twinge of disappointment. But Jayne Ann Krentz (Jayne Castle) won for Dark Light. And she is a wonderful lady and I love, and buy, all her work. They are main comfort reads for me, whether she is Jayne Castle, Jayne Ann Krentz, or Amanda Quick. Those books are rewards...I got the latest as soon as I finished Heart Change. So I can honestly say that I am sincerely happy she won the PEARL in my category. She is my hero. And since I spent all day yesterday listening to music, trying to put together a strong soundtrack for my WORLDS website page and didn't actually DO the rest of my website work. I need to get to work. But first I'll take a walk. Whatever you do today, YOU'RE a winner. Heart Change is done and out to Beta Readers (and Tannun has already gotten it back to me, THANKS, T., not looking at it quite yet). Heart Journey is not due until December. This is the time I set for doing more proposals for new books/series, but inner rationalizations will be to not stray too much from the Heart series since I'll be working on Heart Change again next week. I've done my most significant emails, to my editor's assistant asking that since they are going to an online editing system, can I submit online? To my critique buddies telling them that I'm going to miss the 28th because I'll be in Greeley, signing. To Tannun, for thanks to getting to Heart Change so quickly, to PerkyGoth telling her that the PEARLS are tonight and Heart Fate is up (though I am not sanguine, I have done little promoting to the paranormal group) so I won't be available for our playdate. Update my website (that will take most of the day), answer some emails (email is usually 3+ hours), maybe update my Profantasy software (which I've purchased and received from Britain), so I can make a floorplan of D'Marigold Residence (I am not competent in this software so it takes me quite long, never did get the BalmHeal garden done in all it's glory). Walk to the store for bread. Looks like it's going to be sunny. Maybe enter the More Than Magic contest, though entering contests with series books tends to be iffy. I think the books stand on their own, but I am not a good judge. Read contest entries. So I have plenty of "work" or "work related" to do, and my "workday" will end at about 9 pm after the PEARLS. May you enjoy your day, whether it is structured or not. D'Sea is a mental Healer, she is an emotional Healer and can use distancing Flair to make a grief/horror seem in the past, or drain emotion from it. D'SilverFir has telempathy and that means reading and sensing others' thoughts and emotions. She would be appalled at the thought of influencing their emotions or thoughts. She is a judge, not a Healer. Signet D'Marigold is somewhat of a Healer, and we'll see if how I set that up works for you all. As for regular Healers, they deal mostly with the physical body, anatomy, and many wouldn't want to mess with anything else. Some secondary characters are possible set ups that I'm fumbling with for heroines. The-mystic-that-lives-in-the-hills was originally going to be Helena D'Elcampane before I figured out the plot, now her being an explorer and cartographer is more important. I may use the mystic as a teacher for one of my heroines though. The cursebreaker was interesting because I am continuing to think about that vocation. Some Families and Flairs die out, this is Celta where humans still only have a toe-hold on the planet. I believe that in HeartMate one of Tinne's possible Flairs was as a cursebreaker, but I decided I didn't want to go there with him. Thank you, may you have mind expanding thoughts today. I've finished reading and marking up Heart Change. I like it, and don't think there are any excess scenes in it, so it might very well come in 500+ (currently 519). As soon as I transcribe all the edits, I'll send it out to my beta readers. Very tired today as I did most of it today, having commitments on Sat and Sun. Take care, and may you feel satisfied. May you be rekindled today. All right, I woke up and the day was gray and cold with snow riming the ground and icing the windshield of my car. My edits for Heart Change await. The teakettle whistles and I prepare my cup while looking out the kitchen window. "It's a cruddy day," I say to the cats (who already know because they are being forced to eat turkey with butternut squash instead of the quail they liked yesterday). "But I'm in Celta!" And I'm looking forward to the book after a week and a half away, then I recall the opening and say, "It's a cruddy day in Celta, too..."
But I know in the book that the weather will warm and flowers will be out in the next couple of days and in the next hour Signet's life will change, and that makes me smile. So may you enjoy the books you're reading now. May you enjoy the simple pleasure of living today. I have both a Cast of Characters and a Family tree in the last couple of books. However, they are of the Holly/Blackthorn/Winterberry Family which was the opposite side of the feud from the Hawthorn/Maytree Family so I need to do another one. Even my mentor is getting confused ;). Tomorrow I start the deep editing and revising of Heart Change and plan on doing very long days until Monday night, when I'll give it to my mentor and maybe a beta reader or two. That's it for today. It's been a challenging day and I'm tired. I did throw out some questions for you all in comments. May you have a lovely evening and night. Wow, I've been concentrating on Laev's book and just saw all the comments. Anyway, I do recall off the top of my head that T'Ash's mother was a perfumer. BTW, Dontea (D'Ash's daughter) breezes in on about page 5. I have to be careful to emphasize that Laev thinks of her as a daughter so no one thinks any hanky panky will be going on (he'd be appalled, but Celtan standards are Earth standards and I need to conform to most Earth standards). Also to clue readers in that she is NOT the heroine. I'm having a fabulous time with Laev, Camellia Darjeeling (the heroine), my new private investigator, Garrett Primross (as a manly man he objected to Primrose), and the starship Nuada's Sword....many secrets. So, Nuin as animal healer and geologist? Or vice versa? May you enjoy all the input you give today. So I finished up Heart Change, but decided to keep my mind in Celta and started thinking about Laev Hawthorn (up 3 of 3) and skipping 15 years and how old that would make T'Ash's (Rand T'Ash, my first hero, of HeartMate) children. Now I knew from writing HeartMate that T'Ash would have four children, two boys and two girls. One of them (a son) was already born as of Heart Quest (Winterberry, policeman and Trif Clover, musician), Nuin. I knew that Heart Change, Signet's book, would have the birth of the next two -- fraternal twins, a boy and a girl. Now how to get them, or one of them, in Laev Hawthorn's story? This is what I thought of when I went to bed for a few nights. Well...T'Ash is a wonderful jewelry maker, but he doesn't consider himself an artist and thinks artists are wimps, so he'd probably pass that down to his sons. I've had Nuin precocious, but he could grow out of that. I think everyone thought of him as T'Ash's heir, too. But...why? On Celta, it's usually the most strongly Flaired child, or the child that shows the most Family Flair who becomes the next GreatLord or GreatLady. Why not make it a girl? The first girl is one of the twins, so why not? How would she fit into Laev's book? T'Ash lost his Family. He is very, very focused on Family, on keeping his line going, etc. This, too, he'd pass down to his children. So, say, what if Laev becomes a businessman like his deceased father and FatherSire T'Hawthorn? What if this girl twin shows an excellent propensity for business (which T'Ash would greatly value because he'd been poor and struggled)? Would T'Ash apprentice her to Laev? I think so. And she will become the next holder of the title, GreatLady D'Ash. I like it. So, the other girl? Easy, jewelry designer. Now the boys. The twin boy -- how about a strong and silent blacksmith like his father? Especially since I've decided to make the twin girl quite irrepressible. That leave's Nuin, the precocious. I have to check what I've said about him, but I think that's about it, not much about his Flair. I've decided he's going to be a geologist. T'Ash is interested in stones and gems, so this could follow. Furthermore a geologist would fit well with the subplot I plan to introduce in Heart Journey. That's it, and now that I've confused you all, I'll wish you a wonderful day. At least I have my ideas down for myself, so now I'll save them. I went out and bought new "work" clothes. I like really roomie sweats and Minnie Mouse is looking REALLY bad with all those tea/car grease/black stains on her. The blue CO shirt ditto, except, of course, it has some sort of white stuff. Not to mention my fav nubby shirt that now has extreme holes. I dress in layers in the winter, t-shirt (or other) next to the skin, turtleneck, then big, floppy shirt. Since I have a heated waterbed, with drawers, they are usually fairly warm when I get up. So, to the thrift store. And I found cashmere sweaters for against my skin! True, they had a couple of tiny holes which, if mended, would show the mending, but, like, who cares? At $9.99 and $6.99, bargains! Are they real cashmere? Don't know, but they say so and do feel nice. Got a couple of interesting sweat shirts, a Rocky Mountain National Park one, and some local city-government sports team (Longmont, I think). May you enjoy your appearance today. Laev's Book...15 Years Later, What Happens In The Intervening Years? I sold three books, two of which were proposals: they had pages (chapters) and synopses (summaries). The third was "untitled Heart book." 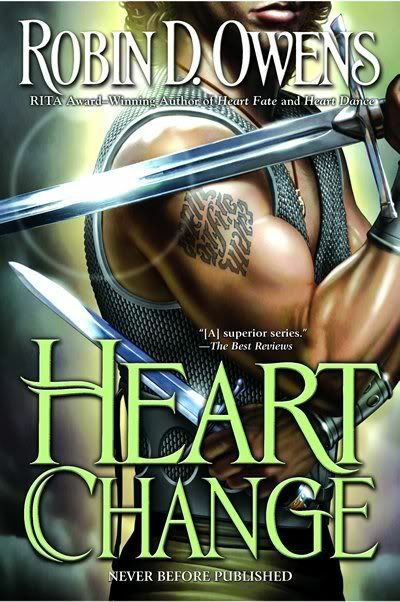 I've been thinking of "slipping" about fifteen years for Laev Hawthorn's book, and, in fact, set up his subplot in Heart Change. I hadn't really planned on Laev before last year, but he's coming of age in Heart Change, and Cratag is T'Hawthorn's captain of the guard, so it fit. I still don't know much about the book, except Laev makes a terrible mistake (ok, he already made one terrible mistake in Heart Duel, but that mostly affected others), so he is not exactly trusting his judgment...still working the plot out, though I do know the heroine and what she's doing, if not her total character. If you all have ideas, I'll listen but won't promise to use them. ;) Oh, and brainstorming about Laev's creative Flair would be welcome. He's a rich young man who lives in a castle so a small, portable creative Flair is not necessary. So, I started Laev Hawthorn's book, and in the first paragraphs of the book, a conversation with someone new, Garrett Primeross is interesting enough to hook me. By a couple of hours later I have his name, the name of his Family firm, his status/class, more of his characteristics, the kind of heroine he should have who would make him crazy and a couple of big things that would happen in his book -- if it ever gets written. It's fun, it's interesting, and I really hope to keep the stories fresh. Anyway, it's cool to think about. May you smile at yourself today. Yes, I do, more often than not. This is especially true if my wordcount has been less than stellar the previous week. Today I did a signing with three other authors and I practiced a reading beforehand. No new words. And I was persuaded to make an appointment to go into Second Life so I can set up some readings. I HAVE downloaded the software, made an avatar...and am currently stuck in some gallery in Scotland. Truth. I'll also be sending out a workshop proposal I pitched in December "Ten Things You Need In The First Three Pages." All of that's work, and all needs preparation away from writing. The glamorous life of a writer. WOW, when I looked at the signing information for tomorrow I noticed I didn't have the time or address. So here's a little about Who Else Books at The Denver Book Mall. Who Else! Books is a small business run by Nina and Ron Else. We're at Denver Book Mall, 32 N. Broadway, Denver, CO 80203, 303-733-3808. This is a sort of co-op arrangement, with 20 book sellers in the store. Starts 3pm. Usually a few food goodies. Louisville Public Library on Saturday, February 7, 2009, from 1-3pm. 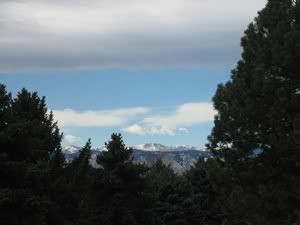 The event is free, but space is limited so call 303-335-4849 ext 4 to register yourself soon. February 8, 2009, 3:00 -- FOUR romance writers! Enjoy all your outings today. Anyway, I needed a title for the book file and came up with Heart Light...then decided that would be better for Vinni and Avellana's book (if I ever sell more), since Avellana is a holographic artist (bending light). So I changed Laev's book, the third book I sold in this last go 'round, to Heart Hope. It doesn't have much of a ring, but let's just say Laev needs hope (you will see why -- a train wreck waiting to happen -- in Heart Change), so Heart Hope is better than nothing. I didn't want to name the file, Laev's Story, though all my Exotic Summoning files are by name (mainly because they were supposed to be alphabetical AND Luna kept changing titles on me). The war is finally over. But Wren's life is in tatters. The only living offspring of the notorious Drakken Warlord, her genes could very well start a new dynasty of terror. And the Coalition can't have that. She alone holds the key to finding a legendary treasure. Having seen enough bloodshed, shy, petite Wren vows to destroy it before anyone, Drakken, Coalition or Earth, can get their hands on it - but she'll need help. The Drakken's ruthless evil turned Aral toward the Coalition years ago. 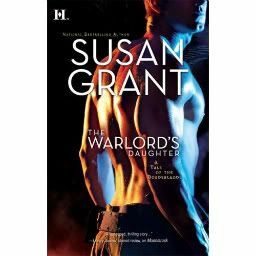 War is all he knows, until he finds passion and love in the most unlikely of women - the Warlord's Daughter. 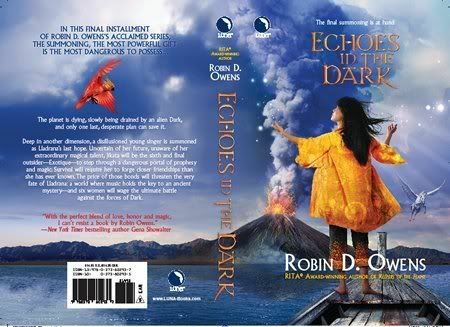 But will trusting each other with their secrets risk not only their hearts, but their lives? May you be please with yourself today. WHEW. Heart Change is done!! The rough of the 13th book is finISHED. It is long, but not as long as I expected. It stands at 38 chapters and 532 pages. I hope to get it down to 500 (a standard ream of paper). Tightening should be fine, cutting a paragraph here and there, etc. I'm sure some chapters have widows and orphans (a few words or one line on the last page). It's all put together and in one big file now, too. Easier to do global searches and replace that way. The new "working" file has been made and that's where I'll work from. Everything else is saved. I had a huge chunk of chapters 28-38 just in scenes...ok, I'm rambling. I'm a little worried that I've fallen into a couple of patterns with the books, so I'll think on it...and some chapters are plot heavy and romance light. STILL rambling, so I'll shut up. May you enjoy whatever you finish today. Also Skyline Park in Road of Adventure. May what you see inspire you. All right, I finally found the photographer for "D'Marigold Residence" in Heart Change. Thanks to Valerie, and Student Britannica. :) The building is in the tiny town of Corenna Plini which has no shops or restaurants and is apparently very medieval. 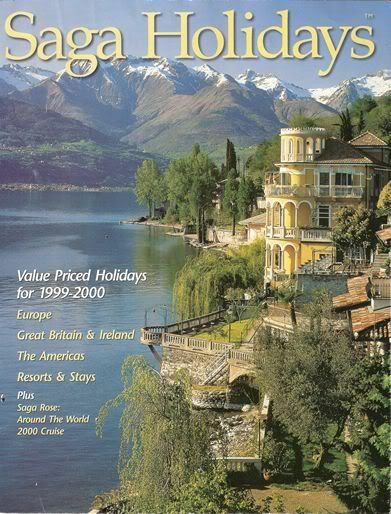 I also learned a little about Lake Como (I think of lakes as being, well, confined and generally roundish ;) )and Dervio. Apparently Corenna Plini also has a castle and that is more photographed -- or the town. This is really the only one of the house that I've found. May you enjoy your views. May what you see today please you.